We all love kids and to work for bringing happiness on the face of our kids. We promote kids to save money and buy their products from their pocket money. But when they will go to shop, they have to pay extra money to shopkeeper than actual cost of product. Extra money will be sale tax or VAT. When you will tell your kids that product’s cost increased due to deducting tax on the price of product, your kid will not understand. So, as parent, it is your duty to teach the basics of sale tax to your kids. One side it will increase the knowledge of your kids. Second, they will save correct money for buying any product and will take the receipt for any buying. Through this, kids can also utilize their tax money for growing the nation. 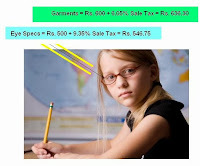 Following are the main steps of teaching the kids about sale tax. They are two main resources of earning of govt. One is income tax and other is sale tax. Income tax is charged on the total income of anybody. Sale tax is charged on the total sale to anybody. For example, you have bought Rs. 100’s product. If its sale tax is 10%, it means, you have to pay Rs. 110. Rs. 100 for product price and Rs. 10 for sale tax. Shop keeper will never keep Rs. 10 in his pocket, he will deposit it in Govt.’s bank account. Govt. Will use this money for social and welfare activities. For example, park are made by govt. Its construction cost will be Crores of Rs. All are collected from tax. In same park, kids are enjoy and doing exercise. It is not possible that a person make such park, road or railways. So, to pay sale tax is must. Problem 1 : If your kid buy $ 1256 and sale tax rate is 4.6%, then what is the amount your kid pay to shop keeper. What is the amount of sale tax? Sometime your kid sells his old toy or other things at his profit. Then you also teach that if he will a retailer, you will get also right the sale tax. One side, your vendor receives sale tax and other side, you have received sale tax. Difference will be deposited by you to govt. Account. It is the excess of VAT output over VAT input. Now, you can make your own problems for taking the test to your kids. In end, if your kid is in India, you have to tell that now, sale tax has been converted into VAT. But, there is not any difference for a final customers who do not want to resell it to others. Every state has its own VAT rules and regulation. Different items have different sale tax rates. So, when you buy anything in the market, show its bill to your kid. For example, Recently, I went to a hotel for eating food when he gave me the bill, he also charged both sale tax and service tax. I was agree that I bought something, so, I have to pay sale tax but why I have to pay the service tax. The owner of hotel told me that he is also service provider of AC. For this, its service tax is must. Like, this, you can give lots of practical examples to your kids.